So, here I am taking a little stroll. This was a while back during a trip to visit the grandpeep. Very quiet neighborhood so I was off leash. But, guess what I did this morning? I took myself from my backyard kingdom into my side yard. And my front yard. And all around the yard. And nobody knew it. One peep was in the office working. The other peep drove up from a meeting to find me unattended. Out. Of. The. Gate. It was the wildest thing. Being all alone like that. Huuummmm……wonder how that happened? I haven’t a clue. And if I did, I wouldn’t tell the peeps. Gotta keep ’em guessing. They were scared though. Sorry about that peeps. 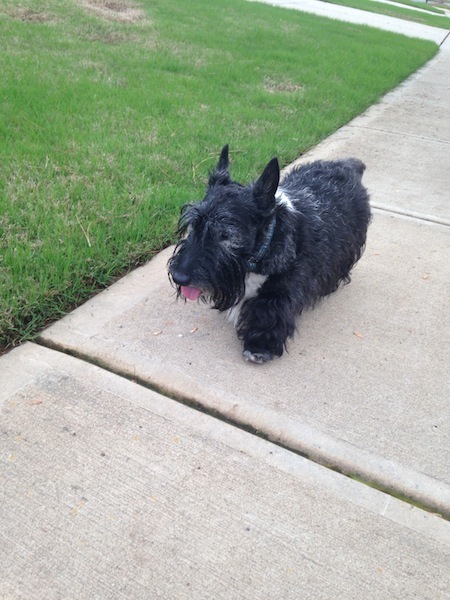 This entry was posted in The Scottie Chronicles and tagged animals, dog behavior, dogs, love, pets, Scotties. Bookmark the permalink. I know you up set the peeps. Some unkind person could have taken you away from them. I know this does happen. So do not do that again Stuart. I didn’t mean to. I’m not even sure how I got out of the yard. I’m hanging my head in shame. I mean, I don’t remember how I got out of my gate. See how upset I am about this? We have been on a few “dog walkies” as SHE calls them. Once I (Duffy) walked out the door when HE was giving out Howloweenie candy…..just followed the kiddies down the street. Mum was freaking out cuz our neighborhood is not lighted at night and we are all 3 black which is undetectable. SHE did find me across the street – just visiting the neighbor, Sam the Collie. HE got a good scolding. Andy took a dog walkie just the other day when the gate was left open, but he came right back cuz it was dinner time. You’d better be careful, don’t take any treats from strangers! Wouldn’t want you to get snatched up. The peeps hope somebody left a gate open and They didn’t notice. Otherwise, how’d I get out???? Who knows. And I’m not telling. P.S. Nice pink tongue in the picture – so cute! I was a little parched. Don’t feel so bad Stuart….Bites got out once…roamed a round for a while and could not get back in….now i the gate is open he will not go out there…..told me..Sus, No Water, No Food….don’t ever go! we bet the panicked – one day our gardening service left our back gate open and I took myself over to my buddies house but Mom and Dad were in an absolute panic until they found me. It was a little tense around here too. Live like the gate is always open! But be careful out there. Like Da Sus said….no foodibles or bevvies outside the perimeter. Ooooo, I’ve done this before and my parents were so upset. They said, “What? Don’t you like it here? Would you prefer to still be living on the street?” Then of course Mom added, “Don’t scare me like that. I’d die if something happened to you.” Oops. Yeah, the peepstress was none too happy about my quasi adventure. At least ya gave da peeps a scare. You gotta keep them on their toes!!! Oh, my goodness, what a scare you must have given the Peeps! You have to understand that even though nothing happened to you, it’s always the ‘what if’s’ that the Peeps think of afterwards that can make them sick with worry. Like, what if someone dognapped him? What if he tries to cross a busy street in traffic? What if we never find him again? You get the idea, Stuart. Please remember to always stay safe! What’s with the Anonymous? It’s The Guster! Where is my picture? Thank you for your worry. And, uh, I’m not sure about your photo and name. Huummm…. Stuart, Mama thought she hitched my leash to a neighbor’s mailbox, while she sprinted home to get the umbrella..
Our neighbor’s Cockatiel Dude started screaming to his Peeps that I was loose, even though I was running towards Mama…the neighbor came running out in his PJ’s cause the Dude Alarm had gone off! THAT was so nice of your neighbor!!! wow. We have never been outside without a leash. We are surprised that we don’t have to wear leashes in the house. We even have a gate in the kitchen so that we can’t get to the front door. Mom is overprotective and she plans on staying that way. Dear Stu, Are you sure your REAL name, or maybe your middle name isn’t “Houdini”? That’s what Mum says my name should be, but I just look at her innocent-like, because I dunno what she means—just ‘cuz I get Wiley some times too! Too bad we can’t be “Wiley” together—what FUN that would be! Well, my escape is still unexplained. And only I know the truth. Maybe I am Houdini! You’re not gonna like this. When we moved here (before Kyla) we had a choice of the lots on this cul-de-sac (and you thought birds did do Français). Guests arrived and Kyla bolted for the great desert. It didn’t last long-she hit the vacant lot across the street with the “jumping cholla”. That’s a native plant to avoid-I guess it spreads seed by attaching stuff to you and letting you do the work. The problem is that it attaches by little fish hook thingies (think Velcro) and pulling them out is like pulling teeth from a bird-now why did I pick that example-OUCH. Kyla never bolted again. OUCHHHHHHHHH! No. I don’t like that story. Kyla was no bird brain. OH! How unkind of me. Sorry Kismet! You are no bird brain…no wait…I’d better quit while I’m a head. HA! Well…what happened with you stays with you!!! I wish I could get out on my own. I could go on a GRRRRRREAT bunny hunt. Glad you didn’t go far on your walkie. What an adventure. Oh Ranger, my little young pal, stay home. It’s much safer there. Trust me. She woke up and saw front door open. Dogs not in house. Ran out in PJs to find the two little ones running about front unfenced yard for rabbits! Not too scared of cars, but……….. Bobcats, Coyotes and Javelinas and BIG owls…………… She was not a happy camper with Him who left the door open! See, I think that’s what happened at my house. SomeONE left a gate open…. and you KNOW what happens when that happens. Just sayin’. Glad y’all were OK. The dogs in our little mountain village are always taking themselves for a walk! Let’s see, there’s the pizzeria dog, the wolf-dog named Baskia that lives further up, the scaredy-cat dog that runs away when he sees us….I wish our peeps would let us run loose too. Don’t try it. It’s unnerving. Don’t tell her! Tee hee. OH. I should have thought of that! My phone! Thanks pal. Glad you were safe on your walk-a-bout!